My kids love to stay in the water till they prune and when they were younger, we took a lot of cheap family vacations to area water parks. We could go overnight to Sesame Place, about 2 hours from New York City (and only an hour from Philadelphia) and take advantage of a ticketing policy that let you go for free in the late afternoon the day before you had a ticket. So essentially we got a second day free. And hotels in the immediate area always had great deals so our room cost next to nothing. It was not the Ritz Carlton, but the kids didn’t really know the difference, and we didn’t need to spend on amenities we wouldn’t have time to use. But one problem with water parks in the New York City is the vagaries of weather. We spent many visits there shivering, wrapped in towels, away from the water features. Then friends told us about going to Florida in summer. We always assumed Florida was too hot and for a family holiday during the summer school break yes, it is hot and humid in July and August. But it is also considerably less crowded than during winter and spring breaks, and considerably cheaper. We know plenty of people who drive to Florida from New York, but since none of my kids would even make it out of Brooklyn without puking, we never considered that. But flights to Florida from New York are inexpensive in the summer. And my kids love staying at the Nickelodeon Suites Resort, in Orlando, where every room is a 2 bedroom suite and you can cook a little to save money. From a kid’s perspective, the best thing is the water playground and you can save on a theme park admission by spending an entire day here. There are two water parks, with climbing structures, slides, fountains and zero-entry for toddlers or water phobic moms. 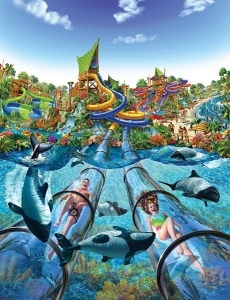 Then there is Aquatica, SeaWorld’s Waterpark, which has wet thrill rides, a wave pool and a lazy river. Just don’t do what we did once – we forgot our bathing suits. We spent over $200 at the park for our family of 5.